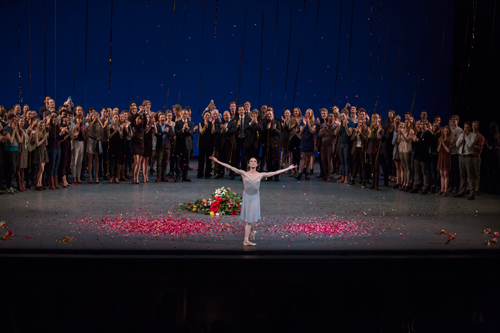 RESTLESS CREATURE: WENDY WHELAN offers an intimate portrait of prima ballerina Wendy Whelan as she prepares to leave New York City Ballet after a record-setting three decades with the company. One of the modern era’s most acclaimed dancers, Whelan was a principal ballerina for NYCB and, over the course of her celebrated career, danced numerous ballets by George Balanchine and Jerome Robbins, as well as new works by more modern standout choreographers like Christopher Wheeldon and Alexei Ratmansky; many roles were made specifically for Whelan. As the film opens, Whelan is 46, battling a painful injury that has kept her from the ballet stage, and facing the prospect of her impending retirement from the company. What we see, as we journey with her, is a woman of tremendous strength, resilience and good humor. We watch Whelan brave the surgery that she hopes will enable her comeback to NYCB and we watch her begin to explore the world of contemporary dance, as she steps outside the traditionally patriarchal world of ballet to create Restless Creature, a collection of four contemporary vignettes forged in collaboration with four young choreographers. Throughout Linda Saffire and Adam Schlesinger’s riveting documentary, we watch Whelan grapple with questions of her own identity and worth. Historical footage shows her dancing as a very young girl in her hometown of Louisville, Kentucky, then as a teenager on her own in New York and, finally, as a rising ballerina with the company. “’If I don’t dance, I’d rather die’—I’ve actually said that,” says Whelan at one point in the film, as she talks about leaving the only environment she knows, and facing what comes next. Whelan’s unflinching honesty, her tireless determination, and her winsome attitude—along with her breathtaking dancing—make RESTLESS CREATURE: WENDY WHELAN not just a fascinating portrait of an artist grappling with change but also a delight to watch. "Restless Creature: Wendy Whelan sets the barre high for dance docs"